The former Soviet republics of Central Asia and the Caspian basin have assumed prominence in Eurasian and global affairs for a number of reasons. 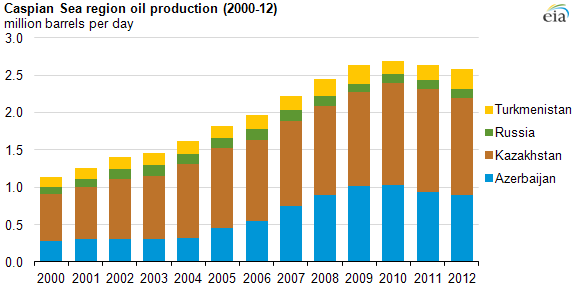 Much of their activity and importance in global markets is concentrated in energy production. While the region has been affected by the global financial crisis of the late 2000s because of falling energy prices and economic malaise in primary export markets (e.g. Russia, China, Europe), there is little question that the region’s energy reserves will make it a continued target for investment by corporations and geopolitical competition among states looking to control and exploit new sources of energy. As the largest successor state of the Soviet Union, Russia was well-positioned to play a dominant role in the Caspian basin. Even though the various “stans” were now independent states, they retained important political, economic, security, and even cultural ties to Moscow. At the end 1991, the Commonwealth of Independent States (CIS) was cobbled together to facilitate a civilized divorce among the post-Soviet successor states, and all the states in the region-save Georgia-embraced it as a means to prevent chaos, conflict, and economic collapse. In terms of energy, all remained tied to old Soviet structures, which meant, among other things, reliance upon the Soviet electrical grid, aforementioned oil and gas pipelines, and ethnic Russian personnel to manage their economic enterprises. Few of the political leaders in the region had been enthusiastic about independence, and maintaining good ties with Moscow was seen as a means, at least initially, to preserve their power. Whereas Russia had a strong hand to play, in the early 1990s it was not excessively involved in the affairs of Central Asia and the Caspian basin. Moscow initially was intent on charting a course of Westernization and approached most of the region with what might be dubbed a policy of benign neglect. There was little push for closer economic or political cooperation and in the realm of energy. Rather, it remained more or less business as usual, with oil and gas flowing north through Russian pipelines, which conveniently meant that Russia controlled the economic lifeline of the region. Although there was a clear recognition of the significance of the region’s oil and gas deposits, in the initial post-Soviet years this factor did not take on immense political importance, and oil production actually declined from 1991 to 1995.6 Indeed, as Irina Zviagelskaia notes, Kazakhstan remained on Russian policymakers’ radar screen more than did other states, but chiefly because of its large ethnic Russian population, not its large oil and gas reserves. This policy changed in the mid-1990s, reflecting a broader shift in Russian foreign policy away from Westernization and toward a “Monroeski Doctrine,” a policy that asserted special rights for Russia in the so-called “near abroad” of the post-Soviet space.8 This took various forms: support for separatists in Abkhazia against Georgia, which was coerced to join the CIS in 1993; aid to the Karabakh Armenians fighting Azerbaijan and a Moscow-supported coup against the pro-Western Azeri President Abulfaz Elchibey; pressure on Kazakh President Nursultan Nazarbaev, among the most pro-Russian of all CIS leaders, to grant dual citizenship and other rights to ethnic Russians. In the last case, the amount of Kazakh oil that could flow through Russian pipelines was limited and, on a few occasions, shut off entirely, with the claim that Kazakh oil was too sulfuric to be transported by the Russian pipeline network.9 As for gas from Turkmenistan, Russia controlled the main export route and was able to set a low price for Turkmen gas and did not allow Turkmen gas to be sold in Europe, meaning Ukraine became the largest consumer for Turkmen gas. With low prices creating disincentives for production, the output of Turkmen gas in 2000 was actually lower than in 1992. Fearing that they could be pushed out of the region, both Russian firms and the Russian state became more active in the region. Regarding ownership and investment, Russia at that time did not have the capital to match Western firms and governments, although many in Moscow no doubt would have preferred to limit or prohibit foreign investment in Caspian energy projects. Whereas Western firms took the leading role in some major projects (e.g. the Tengiz fields in Kazakhstan), Russian firms were not shut out. For example, Lukoil gained a 10 percent stake in the $8 billion 1994 “deal of the century” Azerbaijani Consortium, a 32.5 percent share of Azerbaijan’s offshore Karabakh field, a 10 percent stake in the Shah Deniz fields, and shares in the Kumkol-Lukoil and Tengizchevroil projects in Kazakhstan. Gazprom was included in plans to exploit the Karachaganak field in Kazakhstan. According to many observers, Russian firms often were invited in because excluding them would have been impolitic and would risk sanctions from Moscow (for example, the denial of exports through Russian pipelines), and in some cases they won shares gratis. Even so, the Russian foreign ministry condemned major deals such as the Azerbaijani Consortium as illegitimate because the legal status of the Caspian in the 1990s was still unresolved. However, given the fact that Russian firms at that time had only small stakes in the main projects and that literally dozens of states and firms were invested in the region, throughout the early post-Soviet period Russia had, in ownership terms, a rather modest presence in the region. The same cannot be said of the pipeline issue, a concern that has been central to energy policy in the region because the Caspian states are landlocked. As previously mentioned, when the Soviet Union broke up, all existing pipelines from the region headed north and connected with the Russian pipeline network. This situation was viewed unfavorably by many both in the West and in the Caspian region, and thus by the mid 1990s a constant refrain in discussions of the region was the need to construct new pipelines to transport oil and gas from the region. The issue, of course, had an obvious geopolitical component: what state or states should these pipelines traverse? Many schemes were put forward, including routes across China, Afghanistan, Turkey, Pakistan, Russia, and Iran. In the end, as noted below, the region did acquire multiple pipelines, and plans exist to send Caspian oil and gas to all directions of the compass. Whereas the Russian monopoly on the export of energy was broken in the late 1990s when a small-scale pipeline between Baku and the Georgian port of Supsa became operational and a gas pipeline opened between Turkmenistan and Iran, major export routes continue to traverse Russian territory. For example, the Russian government secured a 24 percent stake in the Caspian Pipeline Consortium (CPC), which built a large-volume (560,000 barrels/day) pipeline from Kazakhstan’s Tengiz fields to the Russian port of Novorossiysk on the Black Sea. This pipeline opened in 2001 and through 2010 remained the largest single oil pipeline out of the region with potential to double its capacity to over 1.3 million barrels a day. One problem, though, is that oil through this pipeline reaches global markets after being shipped through the crowded and dangerous Bosphorus Straits, a sore point with Turkey. With respect to energy policy, the Russians adopted a more targeted and softer approach. Azerbaijan, thanks to Western investment and support for a pipeline that would bring its oil westward, could no longer be bullied by Moscow. Despite concerns that Kazakh oil would compete with Russian oil on world markets, Lukoil, Gazprom, Rosneft, and other Russian companies expanded their involvement in exploratory projects on the Kazakh side of the Caspian shelf and Russia concluded long-term agreements on the transit of Kazakh oil through Russian pipelines.17 Noting these developments, Russian commentators suggested that Kazakhstan, which had remained a “loyal bridgehead” for Russia in the region, may prove to be closer to Russia than the ostensibly “soiuznaia” Belarus. In 2003 Nazarbaev spoke of an oil–gas alliance with Russia and maintained that Russians and Kazakhs are “brothers in blood,” both of which would be anathema to Azeri leaders. 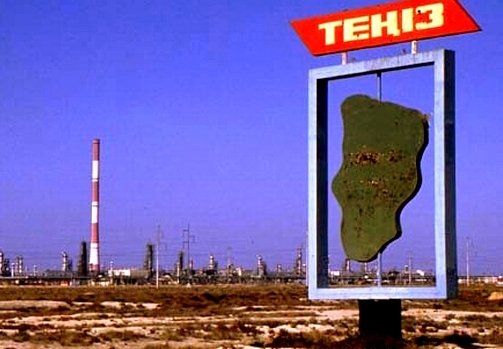 As for Turkmenistan, Ashgabat remained largely isolated internationally allowing Russia to continue to dictate terms for the transit of Turkmen gas. In the 2000s Russia re-emerged as the pre-eminent outside actor in the region, both with respect to security policy (e.g. expanding military cooperation with local states, a larger naval presence in the Caspian, access to military bases, a more assertive military doctrine and in energy. Moreover, given its willingness to play the “gas card” in its dealings with pro-Western governments in Georgia and Ukraine, veiled threats toward Europe with respect to gas supplies, and its military incursion into Georgia in August 2008, one can say that the Russian “bear” is back. And, this was later proved through the events of Crimean annexation and Eastern Ukrainian Conflict in year 2014. Whereas western governments celebrated the (underutilized) BTC, the Russians have moved to enhance their position as a conduit for Caspian hydrocarbons. Plans have been made to upgrade the CPC, which seems likely to be the main export route for Kazakh oil into the foreseeable future. Recognizing that the old Black Sea to Mediterranean route via the Bosphorous is problematic, the Russians took the lead on development of the Burgas–Alexandroupoli pipeline, which would allow Russian and, presumably Caspian oil to bypass the Turkish straits by taking an overland route across Bulgaria and Greece. As for Ukrainian plans to utilize the Odessa–Brody pipeline for Caspian oil, it ran into two problems: a lack of oil and Russian opposition. Ultimately, in 2004, the Ukrainians agreed to reverse the flow, meaning the transported Russian oil southward toward Odessa. Meanwhile, Russia tried to improve relations with Caspian energy producers. In the case of Kazakhstan, the Russians and Kazakhs reached agreement over expanding the capacity of the CPC and sending Kazakh oil through the Burgas–Alexandroupolsi pipeline. Although the plan to put some Kazakh oil on barges and then deposit it into the BTC has not been totally abandoned, the planned export of Kazakh oil through Russia may, in the words of one report, give Russia a “unbreakable stranglehold over Central Asia’s energy reserves” and spell the end of US and European backed plans to build a trans-Caspian oil pipeline. At a time when no major deals have been announced with Western companies, Russian and Kazakh firms agreed to production-sharing agreements on potentially large oil fields such as Kurmangazy, Tscentralnoye, and Tyub-Karagan. With respect to Turkmenistan, Russia can claim two major “victories.” In 2003, Russia concluded a twenty-five year agreement to purchase Turkmen gas, a deal that promises to increase Turkmen gas shipments through Russian pipelines over ten-fold. In May 2007, Russia, Kazakhstan, and Turkmenistan announced agreement on plans to upgrade the Prikaspirski gas pipeline, ensuring in effect that Russia will be able to virtually monopolize the export of Turkmen gas for the foreseeable future. This deal, announced while the EU has having its own energy summit and occurring after rare US lobbying of Turkmenistan, clearly demonstrated Russian influence in the region, a force that the Turkmen President Gurbanguly Berdymukhanmedov (2007-) may deem important for his own domestic political considerations. The Russians became far more active in Uzbekistan as well, with Lukoil concluding a 35 year, $1 billion production sharing agreement with the Uzbeks for the Kendym gas fields and Gazprom pledging in 2005 to invest to modernize the Ustyurt gas field. With agreements in 2007 to refurbish gas pipelines from Uzbekistan, Russia is well-positioned to be the major customer for Uzbek gas. Lastly, even though Russia has not had the best relations with Azerbaijan, it is notable that in 2005, when Western governments were criticizing the Azerbaijani government for unfair parliamentary elections, Russia came to the support of Baku and Azeri President Ilham Aliyev, son of the former president and former head of Azerbaijan’s State Oil Company. With some Western companies pulling out of projects in Azerbaijan after unsuccessful drilling noted below Russian firms may be more willing investors in future deals. In the cases of Kazakhstan and Uzbekistan, the former is most economically successful of all the Caspian states, has been able to make major deals with a number of outside actors. Although it cannot escape its geography and reliance on Russia, it is no Russian puppet. Its deals with Western governments and companies, as well as a burgeoning relationship with China, give it a stronger hand to play vis-à-vis Moscow. Indeed, if in the early 1990s one could speak of Russian coercion against Kazakhstan, over time the relationship has become far more cooperative. The same, although on an even more obvious level, can be said of Uzbekistan. The situations with respect to Azerbaijan and Turkmenistan seem more resolved, but in neither of these cases should one assume that these states have been “won” by an external actor. 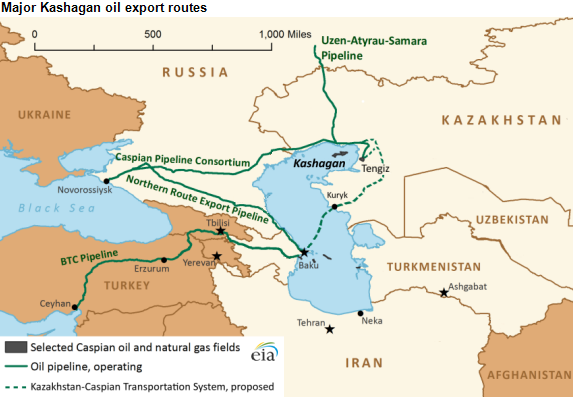 Although Azerbaijan, largely for geographical reasons, has been able to tilt more than any other Caspian energy producer to the West, it retains ties (including oil and gas export routes) with Russia. Potentially, Western efforts to push a democratization agenda on Baku could, as arguably has occurred with the Kazakhs and Uzbeks push the Azeris, closer to Moscow. As for Turkmenistan, its relative isolation and bizarre leadership under Niyazov hampered its ability to engage outside actors. With Niyazov gone, Turkmenistan, while still close to Russia, has concluded deals with the Chinese and remains a major target of Iranian interest. Even though its past and present leaders may be loath to act upon them, it does, so to speak, have options. Although no observer has a crystal ball to forecast accurately the future, if pressed to make a prediction, it seems safe to conclude that Russia and China have the best prospects in the region. Russia has too much of a geographic advantage and a far greater ability to meddle in the domestic politics of Caspian and Central Asian states, all of which must be sensitive to Russian policy.